Our high quality alphanumeric parallel displays feature industry compatible HD44780 4/8 bit controller. Available in 24x2, a unique size for greater versatility. Combine it with our X-board S-series to get your project off the ground faster. Datasheet for the MOP-AL242A parallel display. 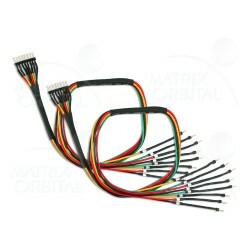 This parallel development cable has been created to get your project off the ground faster than ever..